The colonial experience of the Arab world did not only stunt its social development, it also inhibited the development of class-consciousness. 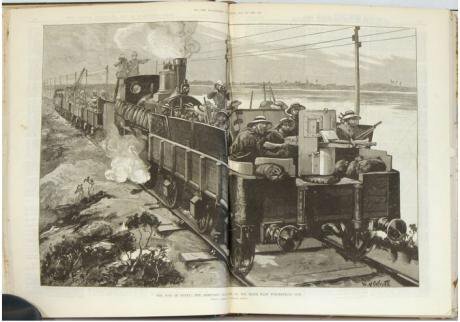 British troop train in Egypt, 1882. Wikicommons/ Illustrated London News. Some rights reserved.The absence of Arab intellectuals in the age of almost unprecedented Arab social and political upheaval is a topic that has occupied me for some time. After years of revolts, mass protests, and civil war, the Arab elites have failed to produce prominent revolutionary as well as the counter-revolutionary intellectuals. Intellectuals who could have articulated the ideological platform of these movements, which is a necessary building block for societal order based on consent, rather than coercion. In lieu of this, they have been relying on pre-packaged slogans of the current regime’s corruption, respect for human rights, or stability and the war on terror. A message of social change and the shape future society should take is almost wholly missing. Even the Islamists, who had been in opposition for decades with a powerful native, moral message, did not present a viable alternative. Once they won elections, Islamist order was not substantially different from the old order; it simply had Islamist packaging. This weakness in Arab intellectual development can be attributed to a number of reasons; however, the colonial history of the Arab world and its impact on Arab capitalist development and class struggle is what is of interest here. Capitalism in the Arab world developed on the periphery of the capitalist world order. Capitalism did not develop as an indigenous system of production; it developed within the colonial epoch, as an externally imposed system of wealth accumulation. This, however, does not mean that there was no form of capitalist development before the advent of the colonial age, but rather that capitalism in the Arab world was primitive, far from the dominant method of production and accumulation. With the advent of colonialism, capitalism in the Arab world developed in a manner that served the metropolis, while the development of an indigenous capitalist class capable of competing with the mother country was inhibited, keeping the Arab bourgeoisie weak and dependent. This is vivid in the case of Egypt, which came under British occupation in 1882. The British started to reconfigure the Egyptian economy as an appendage to the British economy. Egypt was the supplier of raw materials, especially cotton, to the British Empire. At the start of British occupation, the dominant form of production was artisanal. Modern capitalist firms were non-existent in Egypt. As the Egyptian economy was reconfigured along capitalist lines, naturally, a local capitalist class emerged. However, it was dependent on the metropolis. During colonial rule, foreign capital played a dominant role in Egypt’s economy, promoting the local bourgeois to establish Bank Masr, the first Egyptian bank with the explicit aim of combating the hegemony of foreign capital. Thus, the Egyptian bourgeois, similar to their counterparts in the Arab world, did not develop organically, they developed as a byproduct of the imposition of capitalism by the colonial power. This had significant impact on the intellectual development of the elites in the Arab world. Unlike the bourgeoisie of Europe, they did not have to struggle against the domestic class to wrest control of the state. The Arab bourgeoisie did not have to justify their quest for hegemony against a despotic ruler, nor did they have to develop a broad coalition with the lower classes in order to depose kings. Rather, they had to struggle against colonial foreign powers, which means that nationalist rather than class-based ideology started to appear. From this struggle, a nationalist, socially conservative movement emerged, which demanded an end to colonial rule. However, it did not attempt to tackle social questions and did not offer a drastically different vision of society. Preservation of the status quo was key. The prominence of the nationalist struggle against colonial power tempered the class-consciousness and class struggle of the emerging working class and peasantry, as the nationalist card trumped the social card. Thus, even though the nationalist parties were dominated by the elites, the working class and the peasantry flocked to them as the representatives of the nation, especially since foreign capital played a large role in their misery and exploitation. As such, the lower classes also did not develop their own intellectuals who could oppose the native elites or raise social issues. The struggle against the colonial power was paramount. This meant that a culture of paternalism prevailed between the local elites and the lower classes, which persists to this day. After the end of the colonial period, the struggle against imperialism and Zionism still took center stage. The advent of Arab nationalism still placed the struggle against the “outsider” as its main task. Some might argue that the military regimes that took power after the end of the colonial period did initiate a program of substantial reform. This is indeed correct, however, a more nuanced view is that these programs of social reform, having been initiated from the top down, rather than bottom up, were designed to ‘buy off’ the loyalty of the lower classes, keeping class consciousness and struggle to a minimum. The local elites attempted to counter the development of class-consciousness along with intellectual development by propagating the struggle against imperialism as the number one priority. The development of class-consciousness, as such, was stunted in the Arab world due to its colonial or semi-colonial position. Moreover, the weakness of the Arab bourgeoisie also meant that there was weakness in their intellectual development, since they only saw the struggle against the colonial power rather than the local king. This position continues to have impact to the present day. In Egypt today, the elites under President Sisi have relied on conspiracy theories, focusing on foreign enemies, mostly imagined, whose goal is to take over the country. Within this context, the need to protect the motherland trumps any social issues. As Sisi stated in a speech celebrating the anniversary of the coup “We are all Egyptians and there is no reason for disagreement”. If we look at Syria, Assad has also invoked images of a foreign conspiracy that is fueling the revolt against him. Once again, the struggle against imperialism takes center stage. In both cases, the elites did not present an ideological platform that could act as a tool to re-build the social order. The revolutionary forces who have failed to present an alternative vision of society, also repeat this weakness. Besides slogans of political change, human rights, and the need to combat corruption, there has been very little social content. In some way, the paternalistic relationship between the elites and lower classes still prevails. In conclusion, the weak struggle against local elites has hindered the intellectual development of the Arab world, resulting in the masses being in a weak position today. The lack of strong class-consciousness as well as a tradition of class based struggle makes the development of revolutionary intellectuals an arduous task. The colonial experience of the Arab world did not only stunt its social development, inhibiting the development of an independent bourgeoisie, it also inhibited the development of class-consciousness and the intellectual development that would accompany it. The colonial wounds of the Arab world have yet to heal.